Do you need packaging supplies for hot liquids? Well look no further, Custom Printed Hot Paper Cups are the answer! Specially made for hot liquids Gator Paper’s custom printed hot paper cups are the most reliable hot beverage cup on the market. With a classic coffee cup like feel, these cups are made with a matte finish exterior. What’s even better, these amazing cups can be printed with spot PMS color or full color printing. What a great way to show off your brand of delicious coffee! 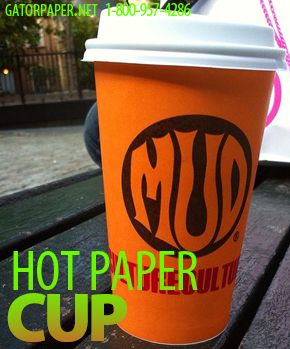 Gator Paper’s custom printed hot paper cups are perfect for coffee, hot tea, water or juice. However, due to the superb heat technology these cups were not designed to accommodate carbonated beverages. When it comes to the food packaging supply industry, Gator Paper tops the market. They offer a vast array of custom printed restaurant supplies such as paper sheets, beverage napkins, French Fri scoop cups, cushion foil sheets, and much more! These top of the line packaging supplies are design with printing capabilities in order for customers to print their logos in full color in the food packaging supplies they purchase. What a brilliant way to market a company image. Just another way Gator Paper puts its customer’s first while building a lasting relationship! Available in many sizes: 9oz, 12oz, 16oz, 17oz, 20oz, 24oz, 32oz, & 44oz sizes. Perfect for package space conservation and food suppliers on the go! Review the website for all information needed to order these wonderful cups. They are available in many sizes: 9oz, 12oz, 16oz, 17oz, 20oz, 24oz, 32oz, & 44oz sizes. For delicious coffee on the go these great cups are available for order with disposable lids. Whether you own a bakery, coffee shop, street side café or food truck with homemade coffee, these Custom Printed Hot Paper Cups are exactly what you need!